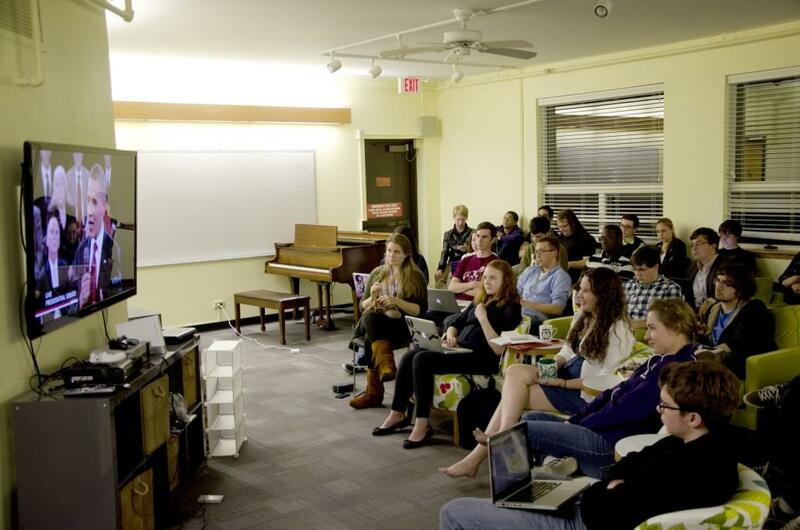 Northwestern students watch the second debate between President Barack Obama and former Massachusetts Gov. Mitt Romney in the Communications Residential College lounge. Tuesday marked the second watch party for the presidential debates hosted by CRC. As President Barack Obama and former Massachusetts Gov. Mitt Romney returned to prime time for the second of three debates, Northwestern students returned to the Communications Residential College to watch and discuss. Tuesday’s town hall-style debate began with a question from a college student, hitting close to home for the 50 CRC residents watching from the couches and floor. Jeremy Epstein, a 20-year-old student, asked the candidates how they could ensure he lands a job after graduation. Rather than specifically focusing on issues of importance to college students, both candidates used the question to discuss the broader topic of the economy. Fisher said he was disappointed by the candidates’ responses but has been pleased with Obama’s record on student loans and increasing Pell grants. Fisher said the issue of student loans likely did not get much attention because Obama has already secured the college-age vote. Fisher’s opinion was reflected in the discussion with LaMay following the debate. When LaMay asked the group of 20 students who stayed for the discussion if any supported Romney, no one said they backed the former governor. One student said she supports neither candidate. During his analysis of the debate, LaMay said voters typically think the candidate they already support won. Following the debate, the consensus among students was that Obama came out stronger than Romney. 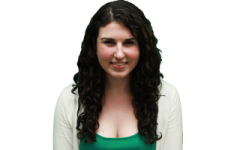 “I think he was really good at shutting Romney down fact-wise,” said Carolyn Betts, a Communication freshman. Many attendees agreed that Obama appeared more strong and forceful than he did in the first debate. LaMay declared a different type of debate winner. Although LaMay admitted that he was biased toward Obama, he said the president’s demeanor had improved since the first debate. LaMay noted that Obama’s tone also changed, becoming more authoritarian by frequently referring to himself as the president and to Romney as a governor. LaMay said he was unsure whether Tuesday’s debate would have a significant impact on the overall race. He said debates are usually remembered for candidates’ gaffes, but there were no major slip-ups Tuesday. Some of the students in attendance disagreed, and during the discussion said Romney emphasized his lack of connection with the American public with his response to a question about equality of pay for women, when he talked about relating to women in the workplace because he had “binders full of women” when looking for members of his cabinet as governor. For Joyce, the topic of equal pay is particularly personal because her father is the president of a union and has spent time lobbying in Washington, D.C.
“We had a stake in that,” Joyce said. She added that she was concerned that Romney’s running mate, Rep. Paul Ryan (R-Wis.), voted against the act. CRC will host its fourth and final debate watch party Monday when communication studies Prof. David Zarefsky will return to discuss foreign policy.